accessorize with optional additions: quick shifters, ignition modules or multifunction hubs to organize all your add ons..
we only sell brand new - with full warranty - power commanders. What is a Power Commander ? How much Power will the PC give me ? Well that can depend upon many things but what we can tell you is "The perfect air/fuel ratio will ensure that the engine can produce the maximum possible horsepower for that given combination". We must also understand that a typical street rider spends a great deal of time riding in part throttle conditions. Shown below are two graphs of a motorcycle before and after installation of the Power Commander. 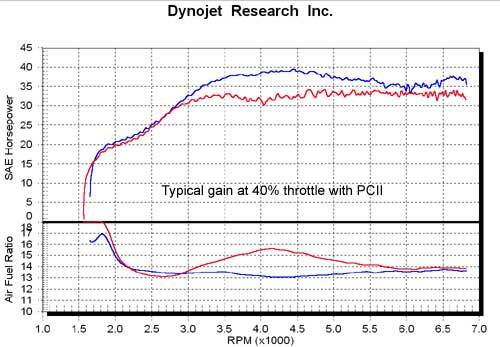 The top graph shows the horsepower curve accelerating at a 40% throttle opening and the lower graph shows the corresponding air / fuel ratio. You can see a large horsepower increase between the two. The red curve shows a typical stock motorcycle with minor performance modifications (slip-on exhaust). The blue curve shows that same combination with the PCIII installed and you can see that the line is nearly straight. So the rider will feel a large improvement while riding the motorcycle and it is very possible that the peak wide open throttle horsepower is unchanged. The correct air/fuel ratio number (say 12.9:1 or 13.2:1) depends upon many factors like combustion chamber design but what we want is that figure at every point in the curve (straight line).